As much as I love beastly, no compromises gaming laptops like MSI’s GT75, sometimes just thinking about systems like that makes my back hurt. I mean, who wants to carry around a 10-pound notebook that needs not one, but two massive power bricks just to get optimal performance? Thankfully, it seems MSI heard my inner desires and took advantage of Nvidia’s recently announced Max-Q RTX GPUs to create something that delivers close to 90 percent of the performance of GT75, but in a body that weighs barely over 5 pounds and measures just 0.75-inches thick. Screw the bulk, the GS75 Stealth is a blazing fast but still practical gaming notebook. Now don’t get me wrong, sporting a 17.3-inch 144Hz screen, the GS75 still has a bit of a wide body. However, by taking the general design of last year’s 15-inch GS65 and stretching it out to accommodate a 17-inch screen, you end up with something that won’t have chiropractors seeing dollar signs. The GS75 fit in my regular messenger bag without too much trouble, though I admit I had to put it in the main storage compartment in front rather than the padded sleeve in back. 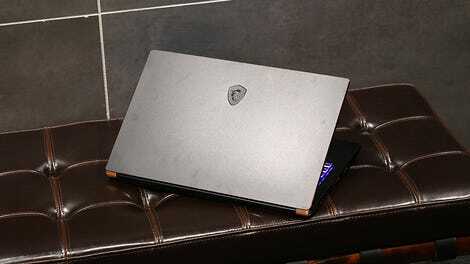 Additionally, while MSI was widening up the GS75, the company also went back and revised some of the features other users and I weren’t totally satisfied with on the GS65, such as its hinges and keyboard. This time, the GS75 sports new, beefier hinges that make the display feel significantly more secure at all angles. Though, if I really nitpick, something about the hinges’ rounded curves and not-quite-matching paint sort of stick out compared to other fine details in the system, like its gold chamfered edges. The new touchpad, on the other hand, is an even bigger improvement. Not only is it 33 percent larger than before, but MSI switched over to an all-new component that features a smoother glazed surface and much more responsive touch recognition. So while you probably still won’t use it over a mouse when gaming, for everything else, the new touchpad is a welcome upgrade. Elsewhere, the GS75's healthy-sized sides offer plenty of ports including both USB-A and USB-C, HDMI 2.0, Ethernet and even a microSD slot. And because it’s MSI, the GS75 also includes the company’s standard gaming package including adjustable per key RGB lighting, Killer networking for better latency while gaming, and MSI’s Dragon Center software to help you keep tabs on all your system info and power settings. Ok, so on to the really important stuff. How well can the GS75 game? It’s a downright thin-and-light slayer. At its native 1920 x 1080 resolution and graphics turned all the way up, the GS75 hit 121 FPS and 91 in Rise of the Tomb Raider and Far Cry 5, respectively. In comparison, the 10-pound GT75 hit 140 FPS and 106 FPS in Tomb Raider and Far Cry, mostly due to the GT75's beefy six-core Intel i9 chip. That’s a difference of only around 15 percent in raw numbers, which if you ask me, is well worth the GS75's much sleeker dimensions. 87 FPS in Shadow of the Tomb Raider with every graphics option turned on ain’t bad, and gives you little headroom for when RTX effects eventually get patched in. But the real treat is playing new titles like Shadow of the Tomb Raider and Battlefield V, the latter of which is one of the few titles that can take advantage of the ray tracing capabilities built into new RTX GPUs. On Shadow of the Tomb Raider with the graphics set to “highest,” the GS75 hit 87 FPS, well above the typical 60 FPS target. Meanwhile, in Battlefield V with the graphics set to ultra including the option for DXR Raytrace Reflections Quality maxed out, the GS75 hovered around 58 to 62 fps. And boy do all those reflections off ice look nice with RTX enabled. With more than enough horsepower to keep frame rates at above 60, the GS75's 144Hz screen really shows its stuff. You have the flexibility to hit 100+ FPS for people who want to have the smoothest action, or the option to turn on every graphical bell and whistle for a truly immersive experience. Sadly, the GS75's lacks support for G-Sync, which seems odd considering the laptop has essentially every other high-end gaming feature you could want outside of eye-tracking. When I asked MSI about the missing feature, their reps said it was a hard choice not to include G-Sync, though MSI hasn’t completely ruled out making the feature available in the future. In previous testing, last year’s GS65 featuring a GTX 1070 GPU posted 94 and 76 FPS in Rise of the Tomb Raider and Far Cry 5 at max settings. That’s about about 20 to 25 percent lower than what we got from the GS75, which is a notable gap. However, without more RTX-enabled games available, it’s probably not worth the upgrade for anyone who purchased a new gaming laptop with a 10-series card recently. The GS75's new hinges are sturdier, but they don’t quite match the rest of the system perfectly. One surprising aspect of the GS75 is its battery life. When set to a balanced battery profile with a few energy savings features enabled in MSI’s Dragon Center, the system lasted 5 hours and 33 minutes on our standard rundown test. And even with those features turned off, I still saw times just north of five hours, which for a system this big and power hungry, is a feat in and of itself. Just don’t expect the same level of longevity while gaming without a power cord, which depending on the game and graphics levels, ends up being closer to two to three hours. The only real downside the GS75 is its price. All told, our review unit costs $3,000 for an i7-8750H CPU, 32GB of RAM, and a 512GB SSD. But truthfully, 32GB of RAM is overkill, and depending on the games you play, the RTX 2080 GPU might be too. By moving down to an RTX 2070 or RTX 2060, you can lop $600 to $800 off its price tag, and suddenly you’re looking at something a lot more reasonable. In some ways, you could even call the GS75 a strange successor to the 17-inch MacBook Pros Apple stopped making in 2012. Yes, it ain’t cheap. 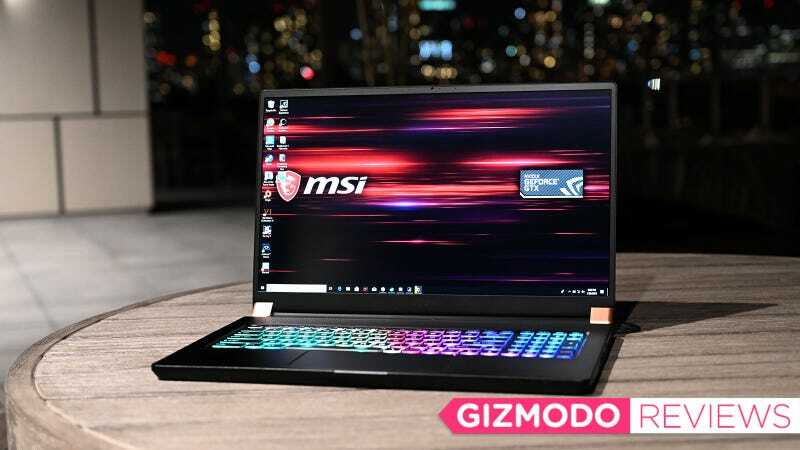 But the GS75's slim design combined with the potential for the best graphics you can get in a laptop right now makes this thing an ideal machine for gamers or creatives who might take their laptop out of the house now and then. It’ll fit in your bag, and it can play almost any game to the max. And if you’re not ready for that much power right now, the GS75 will be ready and waiting to ray trace your next big game when those settings come to more than just Battlefield V.
MSI’s 144Hz screen makes a great companion to Nvidia’s new RTX 2080 Max-Q GPU, but it’d be nice if there were more RTX-enabled games available. Outside of gaming, for a system this big and powerful, the GS75's battery life is pretty respectable at around five hours. At $2800 for the cheapest model with a 2080 GPU, Nvidia’s new top-end graphics card commands a significant premium. But if you’re willing to step down to a 2070 or 2060, the GS75 can be had for as little as $2,400 or $2,100. While it would push the cost up, not having a screen with G-Sync seems like a missed opportunity. The GS75 is half the weight and 65 percent thinner than last year’s GT75 for nearly the same level of performance.